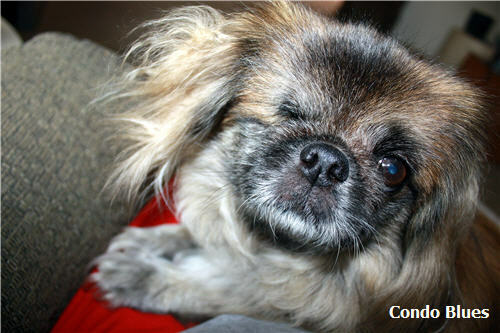 I don’t want to go with a battery operated tea lights or white Christmas tree lights because most evenings around dusk I'm trapped under a Pekingese who demands pets. Look at that face. Would you shoo it off your lap to turn on Halloween lights? Small solar lights will solve the problem nicely. Laziness + solar lights = green living. Yay! 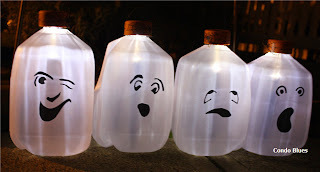 I used small solar garden lights and milk jugs to make solar milk jug ghost luminaries! The construction is so simple I almost don’t have to do a tutorial. Drink milk and save the empty jugs. I didn’t have to wait very long because Husband drinks so much milk I’d park a cow in the garage if city would let me to keep up with the moo juice demand. I asked my household servant to wash the milk jugs and remove the labels. Household servant = the dishwasher. Outdoor Mod Podge stays put during thunderstorms! Cut the top off the milk jug to widen the hole for the solar light. 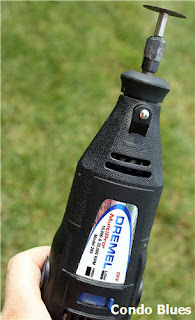 I used the cutting wheel on my Dremel to cut my milk jugs. If you don't have a rotary tool, a pair of scissors also works. I’m using any excuse I can to eke out as much power tool time as I can before it’s too cold to work in the garage. The Dremel cut through that milk jug like but-tah! 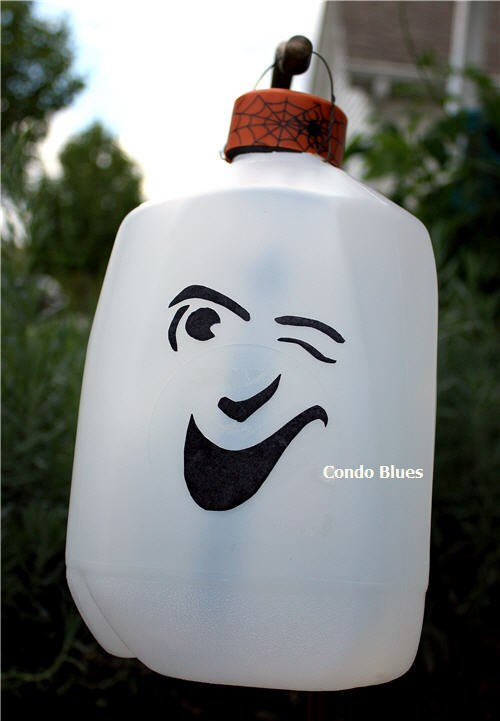 Make a hanger (optional) by poking two holes in the tip of the jug. Again, I used another cutting tip on my Dremel but any sharp object will do. Twist/tie a loop of wire or string through the holes to make the hanger. 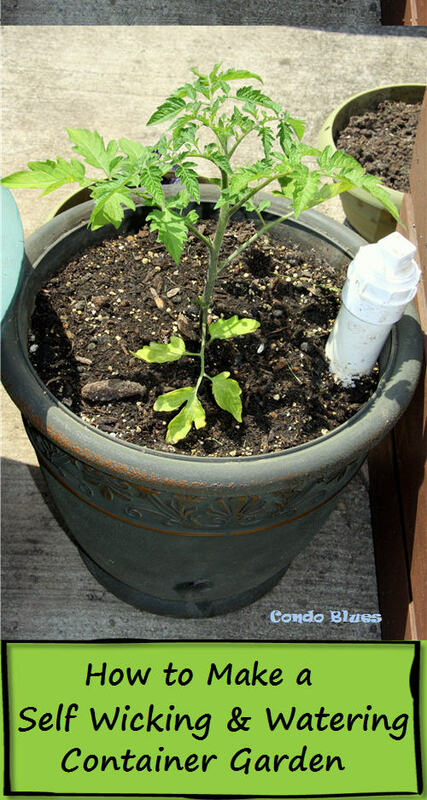 Place a small solar garden light in the hole. I bought my solar lights at the dollar store because I want the little guys. 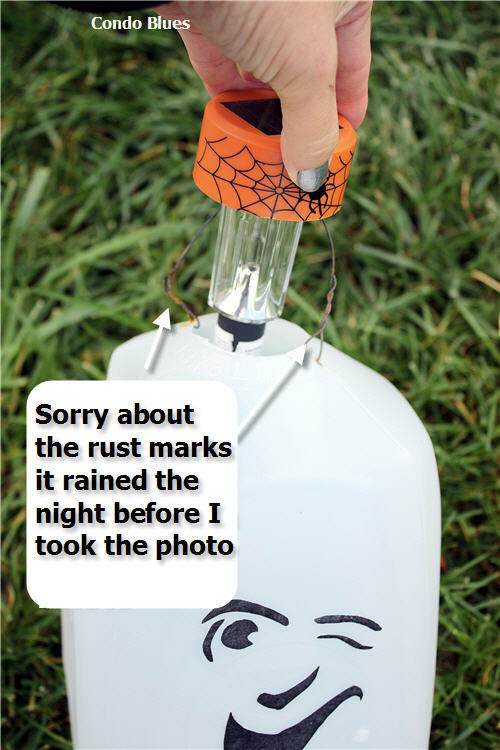 I decided to leave the garden stake on the light to keep the light from tipping out of the milk jug. Hang/place the luminaries in a sunny spot to charge the solar panels. I reused the stakes of the original hanging solar garden lights. The winking guy is my favorite. Hey gang, can you settle an argument for me? I say we can use any rechargeable battery in our dead solar garden lights. Husband says you have to buy special outdoor solar garden light rechargeable batteries. The fate of the universe is at stake. That and dinner. Got the answer? What a great project!! I'm going to share this on my crafty facebook page. Feel free to grab an "I've Been Facebooked" button at my blog! This is a really cool Halloween project. Sorry, I can't answer your question about the batteries, but my money's on you Lisa. These are so cute! Would love to have you join our Halloween craft linkup party! I love your ghost lights, what a great ecofriendly project! I just procured 8 gallon milk jugs via FreeCycle (we just don't drink enough milk in our house) so I'm all set for my weekend project. I might need to get that Dremel thingee - looks like too much fun. As for the rechargeable batteries, I'd go for the cheaper version but...I'd be concerned that they weren't waterproof. Those solar light rechargeable batteries, which I saw at Home Depot when I was there buying the lights for this project, are designed for the outdoorsy things. debbieb0925 - Thanks for the tip Debbie. Yes, Dremels are fun tools. They are so useful depending upon the tips you have and use. I could write and ode to my Dremel. This is great! We go through two gallons of milk a week and I always feel like I'm throwing away something of use. Thanks for sharing this great idea! I bought some small solar lights on sale at the end of the season and now I know how I'm going to use them. I saw your post over at "Thrifty Thursday". Love the milk jugs! So cute! Thanks for visiting the blog and for the sweet comment. I'm glad to hear my husband is not the only one who likes kilts... haha. These are darling! How cute! I'm hosting a Fabulous Fall party over at Not So Simple Housewife and I'd love for you to link this up! We are celebrating Fall and giving me and everybody else some great inspiration. 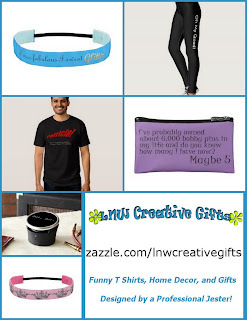 We are looking for crafts, decor, food, and more! I'd love for you to add this and any other fall posts you may have! Very clever, cute, and green! Clever, clever! I love this! What a idea! And super cute as well! Thanks for sharing this @ Show & Share! Happy to have you! Oh this is the best! I love that they use solar and that you are recycling! Yay! These are so cute. I love non-scary ghosts! Oh, they're cute and I love the faces. Thank you for sharing! I'm visiting/following from Katherine's Corner. thanks for sharing at repurposed ideas weekly!